Okieladybug's Scrap N' More: JIG TESTING - I was one of the lucky ones! Mikey allowed me to be one of the testers for his jigs. I had read his posts in the Cricut MB and sent a pm to him and told him "what the heck I will give it a shot and buy some from ya". Lo and Behold he allowed the first ones that pm'd him to be his testers! They came in the mail on Tuesday January 22nd. Ladies (and gentlemen) I have to say I am really surprised how easy it is to use these tools! There were 3 sizes that were sent to me and the handy dandy setting guide. The setting guide tool was a whiz to use for getting your pens or embossing tools in at the right length. No guessing, no mistakes, just simply fit the jig with the screw side to the open end and slide in your tool or pen until it reaches the bottom. Tighten the screw and WAALLAAHH you have it set and good to go in the cricut. The band of the jig fits nicely into the blade holder. I only use Design Studio with my Cricut as I love to manipulate shapes (as most of you already know). 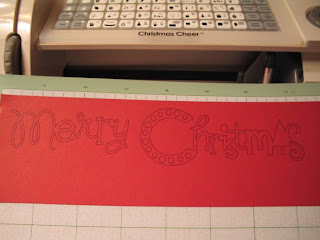 I used an embossing tool I got from Wal-Mart years ago, I think for less than a buck. It is wooden and has two different size ends. It was easily cut in half with a saw, hacksaw to be more specific. Since I have a few of these I decided to sacrifice one in the name of science, Cricut science that is! I picked up some mini gel pens for the experiment from Staples. They were $2.50 for a set of 12. They probably aren't the best gel pens but I can't do any better until I can get to a big city that has a real craft store. Sometimes we have to get by with what we have on hand. The mini Sharpies will fit but NOT the fat mini's, has to be the fine point Mini Sharpies. 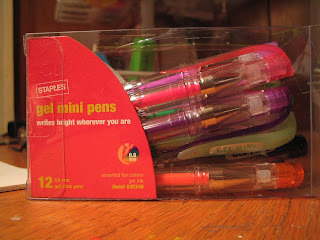 Unfortunately my Staples only had the fat mini Sharpies *frown* and my Wal-Mart had none. I really need to take a trip to OKC for some supplies! Oh yes back to the mini gel pens! Well they fit perfectly in the jig. And they are just the right length (or would that be height since they are vertical..hhmm...Okie you are talking to yourself again and you are suppose to be bloggin your jig testing experience!!) Sorry about that folks...BACK TO THE PROGRAM! As you can see from the picture - PERFECT FIT! I don't know for sure but I bet all mini gels are the same length. If not then I will tell you that these are 3 1/4" in length. In case you don't have a ruler handy, it is almost exactly the same length as a credit card. This information is for if you get the jigs and are at the craft store thinking "hhmm, sure would like to have some of them there pens but I don't know what length to get". Well now you know and have an easy reference to use. Now for the information you are dying to know.. Does it draw designs? YES Does it draw designs easily? 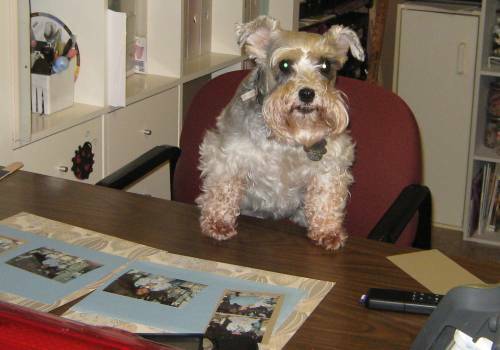 YES Will my stocks go up? How should I know? I am talking about jig testing here...and I have no stock experience. This picture is one that I did on a strip of scrap I had and using a mini gel pen of course! This picture is a bit clearer than the previous one. I had the Cricut set for speed 3 and pressure 4. It didn't seem to have any trouble handling the speed or pressure setting and the lines were nice and even. However we all know that Cricut's can be different and pressure might needed adjusting. 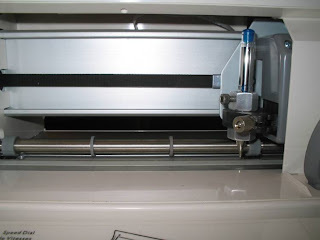 I advise testing on scrap first until you see what does best for your Cricut. Here is a nice shot of the tool that I cut in half. As you can see it fits great! Nice length and does a wonderful job! This shot also shows where the right hand side roller makes the dent in the paper when using the fun foam, (explained in more detail in the next picture description). ONCE AGAIN....GET THE PAZZLES EMBOSSING MAT or something similar. If you look closely you can see the dent at the bottom of the picture caused by the roller on the Cricut. This is why I would not recommend fun foam as an embossing mat unless you are doing a border or something small in a strip. 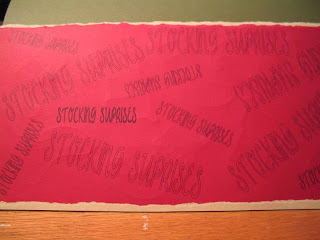 The holly was set at 1 3/8" so you see you can't do an image much bigger and that with the fun foam as an embossing mat and NOT have the roller make a dent in the paper. 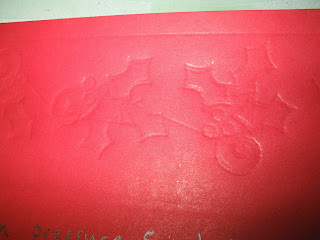 HOWEVER you can see how nicely the embossing worked! Ain't it bee-U-TEE-full! I am thrilled with the result. This is the chiseled effect I talked about earlier. This picture demonstrates what happens if you think to yourself "I am a rebel! 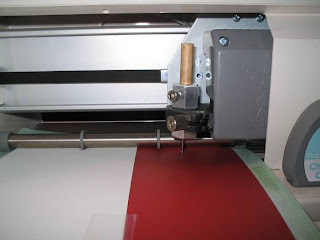 I will set the embossing tool a hair below the line of the guide". Well don't be a rebel!!! All you will end up with is a nicely embossed piece of paper that has drag lines across your pretty image where the embossing tool was set to deep. Yes I was a rebel, but remember I was only doing so for for the sake of Cricut science. Mikey I will not betray your guide again! You can notice the drag line along the top of the image and also from one of the holly leaves to one of the holly berries. The writing you see at the bottom is where I wrote down my notes of speed, pressure, etc so I could remember what was what. MY FINAL WORDS OF REVIEW! The jigs are wonderful! I think they give us options that we have not had before with our Cricuts. While I know the markers are available I like having the ability of being able to write fine lines. 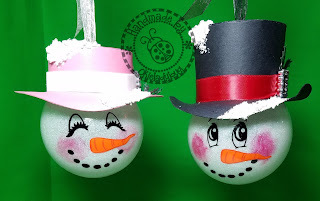 The embossing is wonderful and you can add customized texture to your projects. 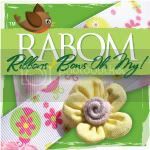 The jigs add to the endless possibilities the Cricut has! I would say a 2 thumbs up and a MUST HAVE to the jigs! Thank you Mikey for allowing me to test your jigs and blog my experience! DISCLAIMER: I was not paid for testing or writing this review. Mikey sent the jigs and asked me to test them. All opinions are honest and my own. If I thought the jigs were not worth buying I would say so. At this point if Mikey asked me to send money for the jigs I would gladly send a payment! That is how wonderful I think the jigs are! Ahhh - ha! So, you were one of the testers, too!! Aren't these jigs great??!! I had a lot of fun using them. I'm off to get some mini gel pens to try next. My daughter is "hiding" her stuff from me because I keep confiscating it to use with the jigs!! Love your post, btw. You have such a great style - so funny!! I have been wondering too who the other testers were! I really love the jigs! Tell your daughter it is important that you use her stuff be because it is for the betterment of mankind, or at least scrapbookers! You now have me wanting them. 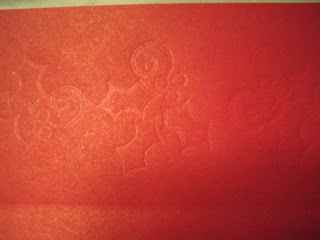 You did mention about the roller marks, but it still would be ok for small area embossing, won't it? Jackie if you are doing something under 2 inches than the fun foam should work fine with the embossing. I did have good luck with tape a piece of fabric to the mat, the fabric was about the thickness of a sweatshirt. 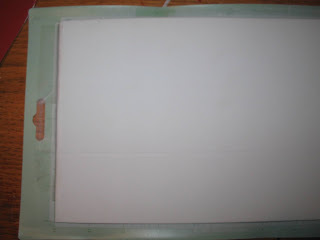 That method didn't leave the roller marks and I was able to emboss a full sheet of 6x12 paper just fine. Hey girl, you did good! Nice of you to test and post all the results, and of course, continuing to enable the rest of us!! Hi Okie Ladybug...I would like to know where I could purchase these 3jigs and setting guide please. Thasnk you. Okie, THANKS foralltheshareing you do!! I just "found" you and just love your blog. Now I want info on the jigs..